BELIZE CITY, BELIZE, MONDAY, 2 July 2018 (CRFM)—The Caribbean Regional Fisheries Mechanism (CRFM) has been working along with United Nations Food and Agriculture Organization (FAO) to develop a set of best practices for small-scale fisheries centered around Fish Aggregating Devices (FADs) in Small Island Developing States (SIDS). The best practices are being documented following a Pacific-Caribbean Nearshore FAD Fisher Exchange with representatives from 7 SIDS in the Caribbean and the Pacific who recently participated in a study tour in Barbados, Grenada, and Dominica. Fishers and Fisheries officials from the Cook Islands, Samoa, Vanuatu and Tonga were in the Caribbean for 12 days, up to the end of May, on a mission organized by the CRFM, in collaboration with the FAO Subregional Office for the Pacific Islands (FAO SAP) in Samoa. They met with fishers and representatives of fisherfolk organizations in the region; government officials and policy-makers; exporters, processors and vendors from the private sector; as well as residents of fishing communities. Gaining knowledge about the use of FADs in the Caribbean will help the Pacific to fulfill the mandate of the 2015 Road Map for Sustainable Pacific Fisheries, which calls for the supply of tuna for domestic consumption in that region to be increased by 40,000 tonnes a year by 2024. 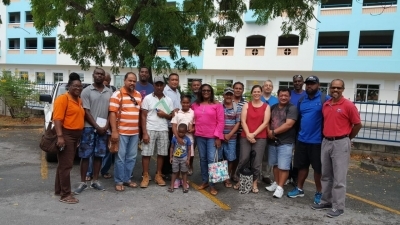 The Pacific delegation had their first information exchange with fishers, fisheries officials and private sector vendors and processors in Barbados, where small tethered FADs (called ‘screelers’) are used to attract flyingfish. Next, they traveled to Grenada, where they met the Minister responsible for Fisheries, Hon. Alvin Dabreo. The Minister expressed his country’s commitment to strengthening collaboration with the Pacific SIDs and promoting the development of sustainable FAD fisheries. 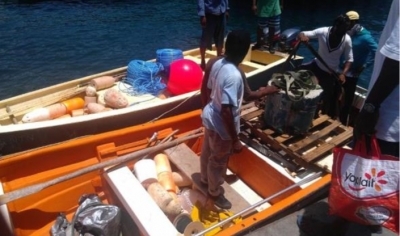 During their visit to Grenada and Dominica, the Pacific delegation teamed up with local fishers to make fishing gear which they used to harvest tunas and other species that had aggregated around the anchored FADs set near the coastline. Grenada operates a vibrant small-scale FAD fishery, which it introduced from Dominica, a leader in FAD technology and operation in the Caribbean. The participants explored and discussed the role of the fishing cooperative in promoting and supporting the development and management of the FAD fishery in that country. The study tour was a critical part of the collaborative and consultative effort by the CRFM and the FAO to facilitate the exchange of fishery-specific information, as well as to collect, synthesize and analyze data and information on the small-scale FAD fisheries in the Caribbean and Pacific SIDS. 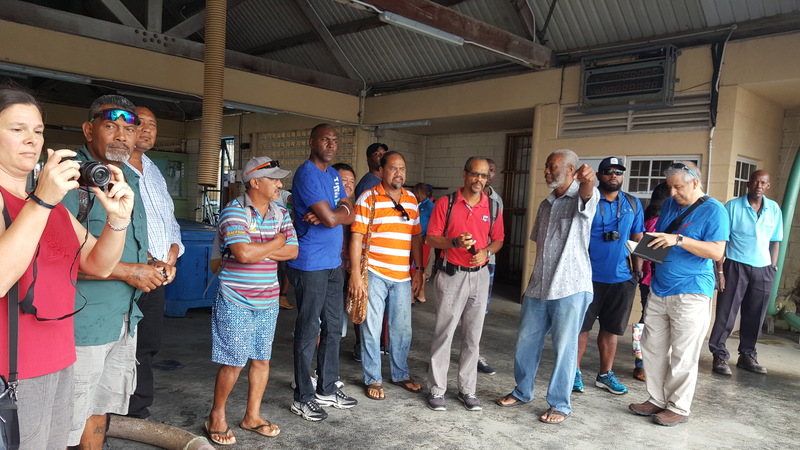 During the tour, participants conducted an analysis of the strengths, weaknesses, opportunities and threats (SWOT analysis) relevant to the FAD fishery, to derive a set of best practices that would support sustainable development and effective management of small-scale FAD fisheries in the Pacific and Caribbean. Back in 2012, Vanuatu introduced a FAD design based on the Caribbean model, which was modified to adapt to maritime conditions in the Pacific. BELIZE CITY, BELIZE, WEDNESDAY, 23 May 2018 (CRFM)—The Caribbean Regional Fisheries Mechanism (CRFM) and the FAO Subregional Office for the Pacific Islands (FAO SAP) in Samoa are collaborating to host the Pacific-Caribbean Nearshore FAD Fisher Exchange – a 12-day study tour in three Caribbean countries. Stakeholders from four Pacific territories – Cook Islands, Vanuatu, Tonga and Samoa – arrived in Barbados this weekend for the first leg of the tour, organized to facilitate the sharing of experiences among stakeholders from the Pacific and Caribbean Small Island Developing States (SIDS). The tour will also facilitate the development of best practices to support sustainable development of small-scale fisheries which rely on the use of Fish Aggregating Devices (FADs). The team began with visits to fish markets and landing sites in Barbados. Tour participants also dialogued while there with members of the local Fisheries Association. They moved on next to Grenada, where they are also to visit fish markets and landing sites, and hold discussions with fishing associations there. The final leg of their tour is Dominica, where they will, likewise, engage stakeholders in that country. 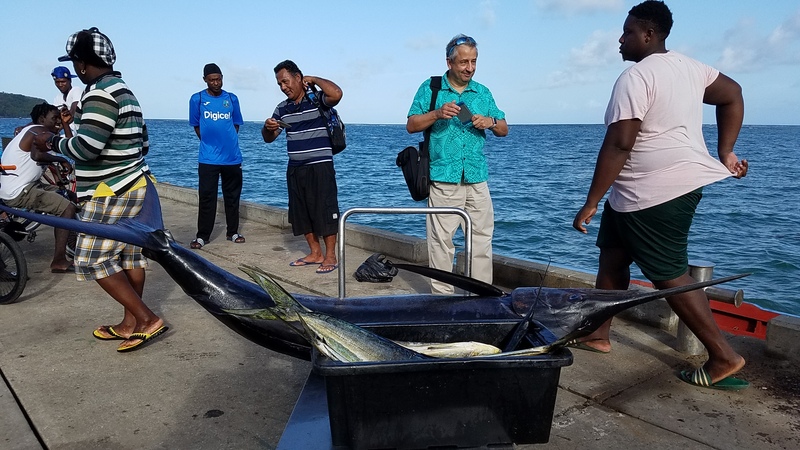 The tour is scheduled to conclude on May 30, and the information shared will be compiled to produce a publication detailing the characteristics and status of small-scale FAD fisheries in the Caribbean and the Pacific. The report will focus on fisheries management, fishing operations, the technology used, the engagement of fishers in decision-making, care of the catch, marketing and sale of products, data collection, as well as best practices for the fisheries. It will be disseminated once finalized. Organizers note that nearshore FADs are gaining momentum in the Pacific region as a tool to enhance food security and income for fishers and communities, and to reduce pressure on the resources of lagoons and reef fisheries. Evaluating FAD fisheries in other parts of the world, such as the Caribbean, can provide greater insights into both risks and opportunities associated with fisheries development, they detailed. FADs are effective in harvesting pelagic fish, and in some countries, they are deployed by fishers or by governments for public use. The study tour is being implemented under a letter of agreement which the CRFM and the FAO signed earlier this month for the sharing of information across SIDS, to identify best practices associated with the sustainable development of small-scale fisheries around anchored FADs. Belize City, Belize, Monday, 21 November 2016 (CRFM)—The coming of the digital age presents novel opportunities for the fisheries and aquaculture sector of the wider Caribbean to build a more robust data and information system that would augment the monitoring of production trends and traceability of catches, support more sustainable management regimes through increased people engagement, and facilitate stronger international and regional trade. The Caribbean Regional Fisheries Mechanism (CRFM) and the United Nations Food and Agriculture Organization (FAO) are teaming up to capitalize on opportunities for Member States to strengthen data collection and management systems through the use of modern technology, such as smartphones and wireless communications to bridge gaps in the system. “Strengthening our fisheries data and information management systems is extremely important going forward. It is necessary in order to improve resource conservation and management and also improve the socio-economic benefits from the fisheries. 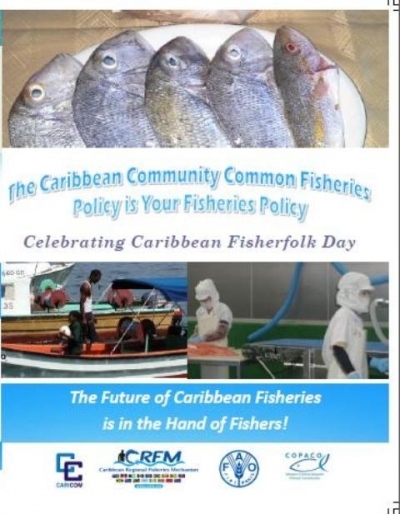 It will help in improving income and revenue from the fisheries and strengthen the countries’ capacity to participate in international trade,” said CRFM Executive Director, Milton Haughton. Haughton said that “…our decisions really need to be based on good knowledge of the resource systems—both in terms of the state of the targeted fish stocks and the marine environment, as well as the activities on land after the fish is taken; that is, activities in the processing and marketing sectors. We really need to have accurate data and information to understand what is happening and to make informed decisions about what is happening in the sector.” Unless traceability is established through enhanced data and information systems, it will become increasingly hard for countries in our region to trade internationally, he said. Haughton highlighted these challenges in his recent discussions with Marc Taconet, Chief of the Statistics and Information Branch of the Fisheries and Aquaculture Policy and Economics Division at the FAO in Rome. 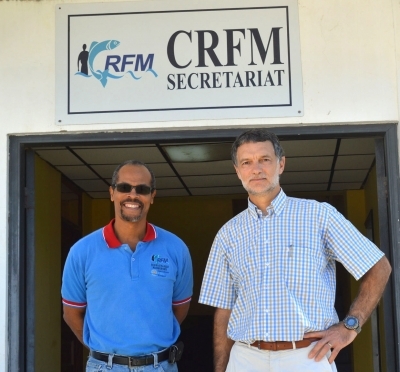 Taconet was on a working visit at the headquarters of the CRFM in Belize City, Belize, last week. He and Haughton talked about strengthening CRFM-FAO cooperation, and they collaborated on a concept note for cooperation in improving data and information systems across CRFM Member States for fisheries and aquaculture. A planning meeting is tentatively slated for February/March 2017. “There are innovative technologies such as the use of mobile phones, tablets, and remote inputs; and the co-involvement of fish workers is necessary to be set up. This is one of the needs that were strongly expressed,” said Taconet, in speaking of wider discussions with fisheries experts from the Caribbean. He said that one gap is the lack of an integrated software system—an issue that was raised when he paid a courtesy call on counterparts of the Belize Fisheries Department, located on the same premises as the CRFM. According to Taconet, the timeline to reach ‘cruise speed,’ with an upgraded data and information system is two to three years. The CRFM and the FAO are currently sourcing funds to undertake this new joint initiative, which furthers a Memorandum of Understanding (MOU) signed this January between the Food and Agriculture Organisation (FAO)/Western Central Atlantic Fisheries Commission (FAO-WECAFC), the Caribbean Regional Fisheries Mechanism, and the Organisation of the Central American Fisheries and Aquaculture Sector (OSPESCA), in Cartagena, Colombia, to facilitate, support and strengthen the coordination of actions to increase the sustainability of fisheries.